I hopped in front of my video camera (iPad) yesterday and just started talking. Then I skipped onto iMovie and by the time I jumped onto YouTube today, voila, I had created a four-part video series teaching you how to identify thoughts that get you to pick your skin, how to choose new thoughts that will lead you away from picking, and how to automatically have the new success thoughts. It takes a method and it takes practice, but I have seen in my clients that it absolutely creates the freedom and ability to choose to do something else rather than pick. Finally, we get really practical in video #4. 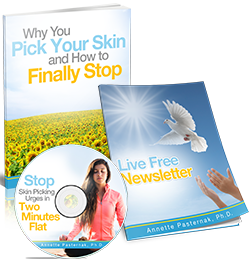 I show you exactly what exercises you need to do to add new thoughts into your mind that will help you succeed in becoming free from skin picking. I tell you how to create your master list of the thoughts you’re having and the new thoughts you are going to answer them / replace them with. Then you need to make either manual index cards or use the app Brainscape, which I demonstrate in the video. Finally, it’s just repetitive practice, practice, practice until you automatically have success-making thoughts! I hope you enjoyed these videos and learned a lot. The real work begins now, when you implement what you learned. 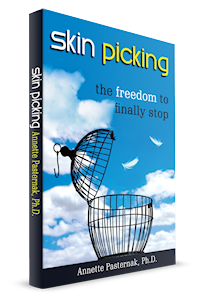 I go way more in-depth into the types of thoughts that cause you to pick in my book, Skin Picking: The Freedom to Finally Stop (also available as an audiobook here). If you’re realizing how much work it is to become free from picking, and feeling like you can’t, or don’t want to, do it alone, contact me to see how coaching can make all the difference.